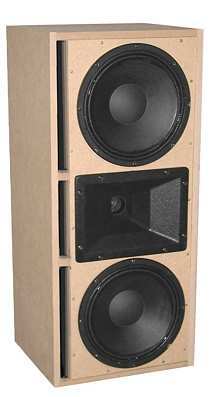 D3672-2-K12 is a high performance full range loudspeaker with 2 x 12'' / 1 x 1.4'' drivers. This speaker shows a wide dispersion over the entire frequency range. ... A feature seldom found on high performance speakers this size: the phase response is correct from 2 metres to beyond 20 metres (for measuring and theory see below). This speaker was designed for high power handling and absolute hi-fi; applications: PA, cinema, monitoring as well as reproduction of classical music in large listening rooms. The original cabinets (see picture) were designed without the projecting side panels to ensure absolute top performance. When using this type of speaker certain rules should be followed: For top hi-fi reproduction the horn should be at ears' height. To have the loudspeaker at ears' height is sufficient at a distance of more than 4 metres. As tweeter the D3672, a 1.4'' Oberton driver with Oberton H955 Horn was chosen. This is the best 1.4'' tweeter we could find in this price range. Two Eminence Kappa 12 were used for bass, a well priced and very efficient driver. If several loudspeakers need to be placed side by side the cabinets should be of trapezoid form. The following frequency response was measured with a calibrated Clio microphone, without any projecting edges. The cabinet was not damped (for PA speakers that's common). Picture above: the frequency response with very small irregularities; when measuring with third noise the small is drop is hardly noticeable (upon request we'll mail the measuring result to you). Picture below: below 0, 15, 30, 45 degree angle (horizontal deviation) from the axis, the lower crossover frequency becomes noticeable. At this frequency the 12'' drivers (they are working up to 1.3 kHz) are still radiating with a wide dispersion. Important for excellent sound is the quick excursion of drivers shown in the following diagram as rapidly declining volume toward the front. This is successfully achieved. Large arrays of drivers where the mid frequencies (e.g. 2 kHz) are produced by more than two speakers show the inherent, distance related fault (some theoretical information) of cancelling out frequencies just above or below the crossover frequency between drivers. A great deal of energy has been mustered to eliminate this fault. After a long time of research the dependency is perfectly low: at 2 metre distance a small anomaly is noticeable at 1200 Hz; the red line shows a slight drop of the sound pressure level. The cabinet consists of 19 mm boards; it's easy to build since all panels are fitted in a right angle. The bass reflex port entry should be countersunk by cutting the baffle and the side wall at an angle ensuring a port that is 50 mm wide. The napped foam should be cut in half ad fitted to the rear wall leaving the bass reflex port uncovered. If the speaker is transported frequently 4 magnet carriers should be attached: the two panels in the drawing that are attached to the rear wall extend from the left bracing panel to the right bracing panel. Two additional panels may be fitted to prevent lateral movement. Trapezoid cabinet: woodworking experts prefer to build a trapezoid cabinet: either with 5 degrees angle on both sides or 10 degrees on one side (opposing the side where the bass reflex port is). The cabinet's rear wall will then be 4.9 mm smaller than the baffle. In order to keep the same volume the cabinet should be made 3.5 cm deeper, resulting in a real wall that is 5.6 smaller than the baffle. Satellite application: in case the loudspeaker is always used in conjunction with a subwoofer, the bass reflex port may be omitted. The cabinet may then be build to a size just big enough for accommodating the drivers. Even with its small 44 litre trapezoid cabinet the frequency range starts at 60 / 100 Hz (at -8 / -3 dB). Woodworking experts prefer to build a trapezoid cabinet: either with 5 degrees angle on both sides or 10 degrees on one side (opposing the side where the bass reflex port is). The cabinet's rear wall will then be 4.9 mm smaller than the baffle. In order to keep the same volume the cabinet should be made 3.5 cm deeper, resulting in a real wall that is 5.6 smaller than the baffle.